Building pioneering projects often requires some type of strong point for attaching a guyline for a tower or derrick. An anchor point might also be needed to anchor one or both ends of a monkey bridge. Sometimes nature will provide a tree or rock in just the right location or you might be able to shift the location of the project to take advantage of a natural anchor. When nature does not provide a solution, anchors can be constructed using stout pioneering stakes. Note: Under no conditions should tent pegs be used for pioneering stakes. They’re not long enough or strong enough to make a safe anchor. Pioneering stakes should be made of hardwood, such as oak or hickory. The most common size of stake (for the projects shown in this pamphlet) is 2-1/2 inches in diameter and about 24 to 30 inches long (see figure 84). After cutting the stake to this size, cut a point on one end. Then bevel the top edge to prevent it from mushrooming or splitting when the stake is driven into the ground. When driving stakes into the ground, it’s best to use a wooden mallet. Using a metal sledge hammer or an ax head will damage the stake. To make a wooden mallet, cut a 4-inch diameter piece of hardwood, such as hickory, elm, or sycamore, about 11 inches long (see figure 85). It should weigh about four pounds. Drill a 1-1/8-inch diameter hole to mount the handle. The handle can be made from a 24-inch length of hardwood (similar to making a stake). Use a knife or ax to round the end of the handle to fit the hole in the mallet head. Secure the handle in place with a wedge placed crosswise to the length of the head. When driving the stake into the ground, drive it at about a 20° angle. Soil conditions can vary and will dictate how large and long a stake you need. 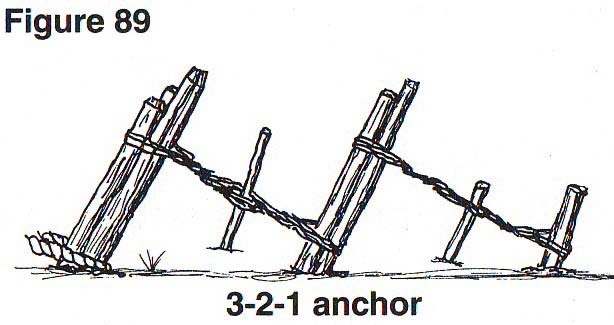 If there will be a heavy strain on the anchor, you might need additional stakes as in the 3-2-1 configuration (shown in figure 89). After the stake is driven into the ground, keep your eye on it as strain is applied to see how it’s holding. 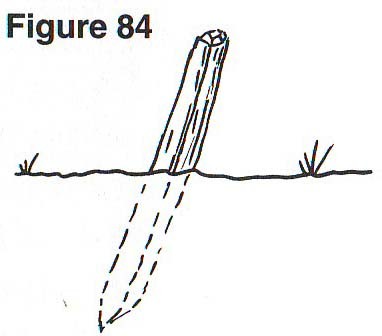 If ground conditions are unsuitable for even the largest stake you have, use a 4-inch diameter spar that’s buried 35 inches in the ground at a 30° angle and anchored in place with a stake (see figure 86). Always attach the guyline around the stake as close to the ground as you can get it. If the guyline is placed or slips higher on the stake, there will probably be enough leverage to pull the stake loose (See figure 87). Both the 3-2-1 anchor and the log-and-stake anchor should be positioned so that the guyline is at a 15° angle, or a maximum of 25°. To determine this, measure the height at the point where the guyline is attached. Double this distance to determine the minimum distance required between the base and the anchor. For example, if the guyline is attached 10′ up the pole, the anchor should be a minimum of 20′ from the base (see figure 88). If your line is long enough, it won’t hurt to place the anchor a few feet further out. As the name implies, the 3-2-1 anchor is made by driving stakes in a series: three stakes, then two stakes, and then one stake to form the anchor (see figure 89). All six stakes are 30 inches long and are driven 18 inches into the ground at a 20° angle. First drive in the set of three stakes. Next drive in the set of two stakes about 24 inches away from the first set. Then tie a rope from the top of the three-stake set to the bottom of the two stake set using at least two loops of 1/4-inch manila rope, or six to eight loops of binder twine. Then use a small stick to twist the rope tight in a tourniquet. After the rope is twisted tight, push the end of the stick in the ground to keep it from unwinding. Finally, drive a single stake in the ground about 12 inches from the two-stake set. Once again, use a twisted rope or binder twine as a tourniquet to hold the two-stake set tightly in place. Depending on the strain, you can use other configurations, such as 2-1-1, or even 1-1-1 for a light strain. When using any stake anchor, be sure that it is in direct alignment with the strain being applied. The log-and-stake anchor is easy to make and can hold a considerable amount of pull. 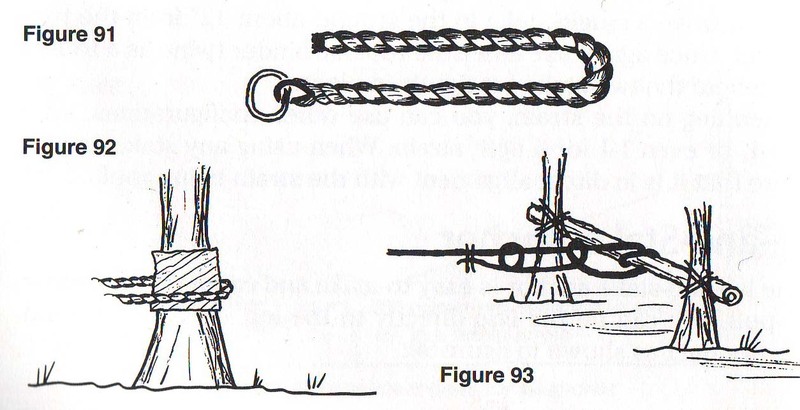 You can tie the line directly to the log, or you can use a ring-and-rope grommet as shown in figure 90. 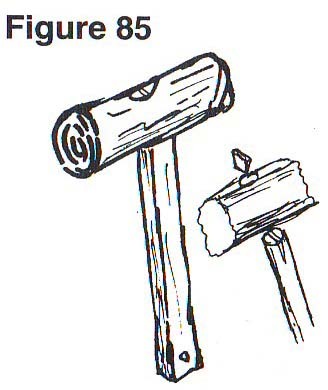 To make the log-and-stake anchor, place a log 4 to 6 inches in diameter perpendicular to the pull of the line. Then drive in four large stakes in front of the log. 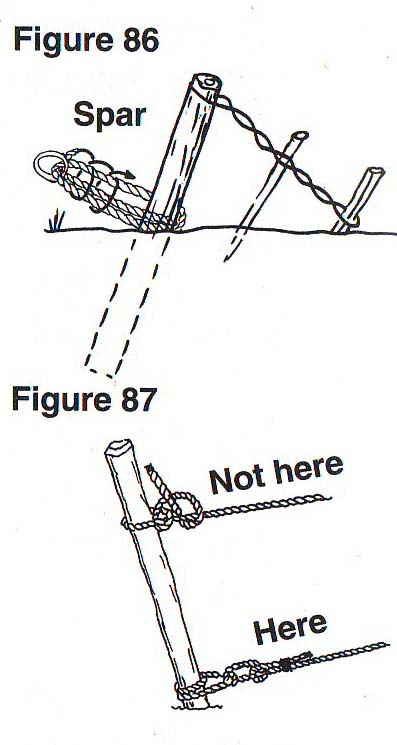 Next, slip the rope grommet through the ring and then slip the ends of the grommet around the log (see figure 90). Drive a second row of stakes 24 inches behind the front stakes. Then anchor the front stakes to the rear stakes with a tourniquet made of binder twine or rope. It is good practice to use a device called a strop to avoid damage to your long lines. It also makes it easier to tie off your long lines and to make adjustments. A strop can be made by using a 10-foot length of 1/2-inch diameter manila or polypropylene rope. To make a strop, splice a thimble and ring into one end of the rope (see figure 91), or use a screw pin shackle with a thimble. The strop can then be wrapped around a rock or tree to attach the line (see figure 92). It can also be used around a spar that is anchored between two trees (see figure 93). Note: Be sure to use a piece of canvas or burlap to protect your rope from sharp edges of a rock or to protect the bark of the tree from rope burns. A grommet is often used in conjunction with an anchor. A large grommet can be made by splicing together the ends of a 10-foot length of 1/2-inch manila or polypropylene rope. If you don’t have a spliced grommet in your pioneering kit, tie the ends of the rope with a square knot or a carrick bend. Be sure to secure the ends of the rope. The completed grommet is useful when attaching a long line to an anchor of stakes. It provides a strong and more convenient way to attach a guyline or other long line. 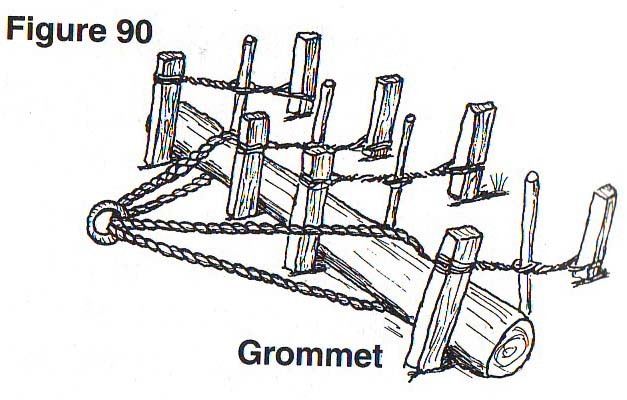 The grommet you use must be made of a larger-diameter rope than the guyline to avoid creating a weak link in the chain between the structure and the anchor.